The replacement of existing rooflights or the incorporation of new rooflights can result in a significant increase in natural daylight which in turn can result in a considerable decrease in lighting costs. 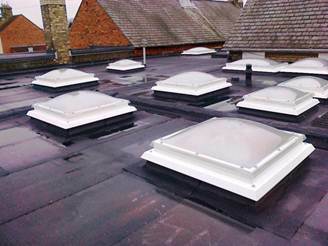 New research proves conclusively that rooflights can save energy in many applications. A well designed building with a good spread of natural light will benefit from passive solar gain and a reduced requirement for artificial light. The combination of these factors means that including rooflights can offer a dramatic reduction in a building’s total energy consumption and the emissions of CO2 associated with this energy use. A naturally lit interior will save money, provide a more pleasant environment people want to spend time in and contribute to our joint goal to reduce emissions of CO2. As well as enhancing your work environment and reducing energy costs old rooflights are often found to be a major cause of water ingress. 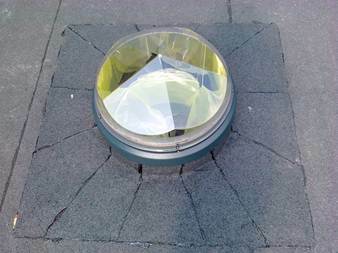 Harmony Roofing Services are able to offer sound and impartial advice on the most suitable roof lighting systems to provide compliance with the requirements of Building Regulations Approved Document L2. This requires increased energy efficiency for all buildings. It recognises the need for daylight, whilst requiring a balance between heat loss from rooflights and the solar heat gain. It should be noted that artificial lighting can be responsible for up to 50% of energy consumption in a building without rooflights. Harmony Roofing Services are able to offer many innovative solutions for your requirement for natural light. Monodraught SUNPIPE® natural daylight systems consist of silverised mirror-finish aluminum tubes that carry daylight down into the room below. The SUNPIPE natural daylight system terminates in the patented Diamond dome, which seals the pipe against the ingress of rain, dust or insects, the ceiling diffuser seals the SUNPIPE natural daylight system at ceiling level. With this arrangement there is virtually no heat loss in winter months and solar gain is minimised during summer months. 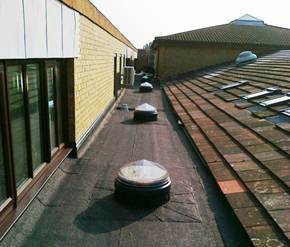 SUNPIPES are ideal for providing daylight into areas in the home where windows cannot reach. Monodraught manufacture a range of six standard sizes from 230mm to 1000mm diameter.